Roll up, roll up. This is your chance to get your hands on a cool £10,000 and be the envy of every match angler in Europe. We are offering you the chance to enter two new matches, each offering £10,000 to the winner in our brand-new competition for summer 2019. 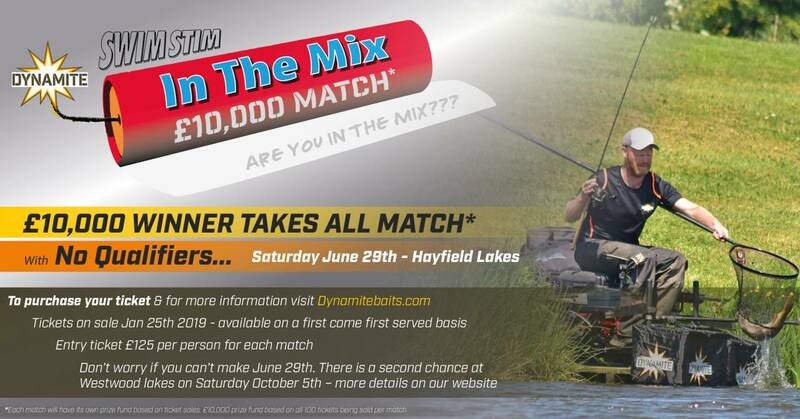 The £10,000 SwimStim In The Mix matches require no qualification with the first match taking place on Saturday, June 29th at Maver Dynamite Hayfield Lakes in Yorkshire. The winner of this match will not only walk away with a whopping £10,000 they will also gain automatic entry into the second match on Saturday October 5th at Westwood Lakes where an additional £10,000 will be up for grabs to the winner! Can you do the double? Both matches are limited to just 100 pegs and will be available on a first come, first served basis. Tickets for the first of the two matches will be available to purchase on our webshop from February 1st, with the other event going on sale later in the summer. £10,000 winner (dependent on sell-out). Plus Dynamite Trophy, £200 bait hamper and free entry to second match. Each of the two SwimStim In The Mix matches are independent of each other with their own prize structures, entry rules and competition rules. Hi will there be room for spectators on the day?